. The notion of an ‘integration strategy’ itself is an interesting concept. For Slovak political scientists the term seems merely to equate to national preferences (national interests as defined by government) although to Western ears the term suggests a more elaborated policy or even a model of integration. Beyond this there is the interesting question of how in a small CEE state like Slovakia preferences are formed in the absence of strongly organized economic groups anticipated as driving the process by ‘liberal intergovernmentalist’ theorists like Andrew Moravcsik – a form of ‘elite intergovermentalism’ or perhaps (my term) ‘intergovernmentalism lite’ with elites and small well articulated lobbies (like the Slovak car assembly industry – fulfilling the function of interest groups in the Moravcsik model “The weakness of interests”, however, a sweeping way of putting it, which echoes the clichéd old tabula rasa argument of a flattened atomised postcommunist civil society. There was, it was noted, clientelistic ties, but methodologically unscrewing this black box was difficult in the extreme. A related question is how Slovakia’s relatively fluid patterns of party competition and fragmented and changing line of parties, which includes both elite vehicles and more socially rooted, well organised formations affects national preference formation. The Slovak ‘party system’ as currently configured apparently produces a pattern of ‘resortism’ with individual parties pressing for separate agendas for ‘their ministries’ (or the ministerial bureaucracies perhaps?). Other arguments to explain Slovakia’s emerge European strategy included ideology – vague and somewhat actor-centred in practice – trade induced (asymmetrical inter-) dependency (a version of neo-functionalism) and the inherent openness of small economies and hence their supported for greater (economic?) integration (adaptation of Katzenstein’s Small States in World Markets argument – this point seemingly contradicted by the current Slovak government’s determination to guard tax and welfare powers at national level. Another incident argument I found interesting is that EU accession had concentrated power in the executive markedly in small states (with the exception of Slovenia, whose more deliberative model of policy making and channels for citizen participation (local referenda etc) appear a legacy of from the relatively liberal late communism period and the more decentralised Yugoslav model of communism. Such centralization it is argued enabled the radicalism and success of Slovakia’s recent neo-liberal reforms – although the sense of needing catch up after the wasted years of Mečiarism clearly provides an impetus – not dissimilar to the Czech sense of falling being after the ‘ice age’ of normalization and readiness for a red-in-tooth and claw market reform of the early 1990s. >More crititical Klaus reflections from 2003 on the Iraq war. Despite his well established critical stance towards the Franco-German axis and belief that the foreign policies of Reagan and Thatcher, rather than West German Ostpolitik had created the geo-political environment for the fall of communism and US foreign policy had lateropened a ‘clear corridor’ for early NATO membership and further development, Klaus rejected the Rumsfeldian notion of an Old (anti-American) Europe and a pro-American ‘New Europe’ of former communist countries in CEE and more reliable US allies in WE such the UK. Although the role of US in the collapse of communism created a ‘loyalty’ in CEE countries domestic factors had been the dominant cause of regime change. CEE thus knew that ‘freedom is not a gift or a good (zboží) that can be exported’. He therefore stressed his right as President of a small country to formulate and assert his own view. After breaking out of the Soviet Empire CEE states wanted to follow their own interests – some he felt which was ‘very American’. Rational doubts about the Iraq war were not a New Anti-Americanism’ – as US neo-cons had argued. In belittling rational criticism they were he claimed paradoxically created a ‘new’ New Americanism into which critics of traditional anti-Americanism (like himself) were being forced (Lidové noviny 26 March 2003). Apart from taking sides in the strange cross-cutting generated by the Iraq war against many of his more neo-con inclined ODS colleagues, Klaus anticipates Fukuyama’s mea culpa about the non-exportabilty of 1989 and the need to not to overgeneralise the fall of communism as a model of rapid and positive regime change. This would also seem to apply to writers like Timothy Garton Ash – and a host of less well known but academically better equipped political scientists (Milada Vachudova’s ever thought provoking book Europe Undivided comes to mind) who see 1989 – rather least democratic consolidation thereafter – as a product of the EU’s ‘soft power’ generated by enlargement. This too may not be a model that can just roll and roll – I suspected the Coloured Revolutions in Ukraine and Georgia (and perhaps just maybe Belarus and Moldova with the passing of some years) are part of this process, but the exportability of the CEE models of democratization, even in the irmore recent form of civic and electoral mobilization against semi-authoritarian nationalists rulers as in Slovakia (1998) Croatia (2000), Serbia (2000) or may be strictly limited exportability. Here, it seems, I am basically with Klaus, although, despite being a professional Klaus-watcher, I have always found the moderate secular conservative of ex-dissident, ex-PM and current Senatir Petr Pithart more intellectually interesting. 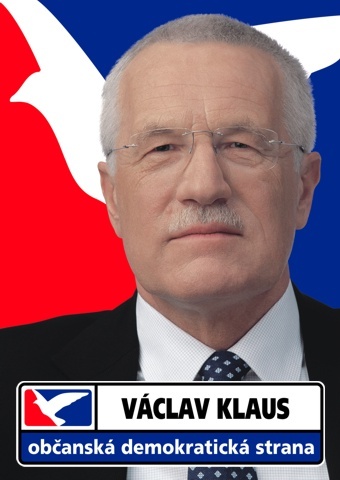 Czech President Václav Klaus’s website offers a rich assortment of Czech right-wing positions, some idiosyncratic to Klaus, some more standard, which mixes propaganda, polemic and just occasionally some rather interesting ideas. Unlike the finally crafted prose of his predecessor, Klaus’s essay havea rather hasty, over wordy blog-like quality to them. I have been reading some of Klaus’s writings from 2003, his first year in office. In the wake of his election as Czech President with the support of Communist deputies, Klaus (LN 26 April 2003) characterized his views not as anti-communist but as ‘non-communist’ – critical of and removed from communist ideologies or parties (whose definition did not interest him) – but not Anti-communism in his view was characterized by an inclination towards authoritarian social engineering and violently imposed change and a desire to re-educate others close to those of the Communists themselves and lacked a positive vision for the future and was an ideology of resentment and jealousy towards those better off than oneself. In conclusion he argues that Czech ‘should carefully study’ the institutional and cultural (psychological) legacies of communism and conceded (contra much centrist liberal Czech anti-communist discourse) that the Czech Communists today would ‘probably not’ introduce a one party system or demand nationalization merely implement dirigiste and etatistic policies like those – he claimed of the Social Democrats. Leaving aside the blurring of the Communists and Social Democrats, some sensible and realistic assessments, but a long way from the Klaus of 1990-1, who rode the tiger of populist anti-communism so well, before now rudely giving its tail a pull and getting off. In speech for the anniversary of the Velvet Revolution (MfD 15 November 2003) Klaus expressed disagreement with the dissident view that ordinary people had collaborated with the totalitarian regime by not protesting or forming opposition groups. There was, he said, ‘resistance, inefficiency, substitute individual activities, the atomisation of society, mere passive existence (žití)’ but it was ordinary people who ‘created the prerequisites’ for 17 November 1989. The experience of communism he argued would be ‘our contribution (vklad)’ to the EU, which lacked such direct experience of such things and so had weaker defence mechanisms against socialist ‘constructivism’ – presumably those embodied in EU integration, although this was left unstated. Here the Czech President indulges very mildly in a familiar form of Czech messianism, more charcteristic of ex-dissidents like Havel or Petr Pithart, albeit with his own faintly populist twist. The little people of normalization new better than the dissident elite that came to lead them. 2003 is also of course the year of intervention in Iraq. Here, Klaus’s well known objections partly reflect his view of rights as culturally embedded in certain civilizations (clash of civilizations, without the clash, as it were) and hence a scepticism of the exportability of liberal democratic institutions, especially when imposed from by force. He is also worried but also a sense that the neo-con project opened up a rolling programme of military intervention and thinks other mechanisms such as effective anti-terrorist strategies will be more effective than starting massive preventative wars (MfD 25 March 2005). He also expressed satisfaction that (for once) as head of state he was expressing the majority view of Czech society. Here one wants to ask what kind of world the Czech President actually wants – he dislikes Krauthammer’s notion of the US as an unchained Gulliver, but wants the rights of small nations to be respected in the absence of the ties and chains of treaties and strong international organizations. Perhaps one should read it as an appeal for a sensible unchained Gulliver. >Founder and former leader of the liberal Freedom Union Jan Ruml (Lidové noviny 8 April 2006) shares the near universal view – confirmed by polling – that the Union is doomed to electoral oblivion. Having failed to form a coalition with the various other small liberal groups, the Union was in fact not undertaking any campaign. Ruml attributes the failure of the Freedom Union to a mix of factors, some more convincing than others – the characteristic inability of liberal politicians to observe party discipline; the Union’s weak political identity, essentially negatively defined against Klaus’s ODS and later the 1998-2002 ‘Opposition Agreement’ between ODS the Social Democrats – its passive and marginal position in the Social Democrat-led government formed after and the internal splits generated by the need to accommodate itself to the Social Democrats’ looser fiscal policies – graphically illustrated in the failure of then party Chairwomen Hana Marvanová to support addition taxation to pay for flood clearing operation in 2002 and her subsequent departure from the party. Ruml’s initial political culture explanation seems a little exaggerated. As most of US leaders were defectors from Klaus’s ultra-disciplined ODS, it is surprising that some basic degree of party discipline couldn’t be maintained, although the desire for an ‘open’ media-friendly party may have undermined it somewhat The difficulties of finding a positive identity is more plausible argument, although as ODS (and a quick reading of some discourse theory shows) itself demonstrates all positive political identity is also negatively defined vis-a vis-an enemy. The problem was perhaps the passing of ODS and the Opposition Agreement and the loss of an enemy, rather than a lack of positive themes – the Union was initially a vehicle for a range of rather innovative reformist ideas, perhaps too many. The final point on right and left touches the issues at the heart of Czech party competition concerning the nature and relationship of left and right, although once again ODS’s co-operation with the left – including the Communists – since 1998 was more extensive and no one is writing the Civic Democrats’ obituary yet. Ultimately, Ruml says, his party became an elite dominated formation whose early grassroots and social support fell oriented only to maintaining its three ministerial portfolios and other posts in ministries and public bodies. A perhaps familiar story with small, top heavy liberal parties across the region. Finally, Ruml argues , despite the clientelism and corruption of both major parties – especially at regional level (where he claimed public contracts were virtually impossible to obtain with paying kickbacks to politicians), he felt a Social Democrat government would be marginally preferable to the ‘Blue totalitarianism’ of an ODS-led administration given the Civic Democrats’ dominance of the Czech Senate and regional government and control of the Presidency. Indeed. A challenge perhaps to currently fashionable political science theories of ‘robust competition’ and left-right alternation as a simple recipe for good quality democracy. >Read with interest of Ernest Gellner’s “Viennese theory” that the anti-totalitarian liberalism of Popper and Hayek reflects the experience of “the individualistic, atomized, cultivated bourgeoisie of the Habsburg capital had to contend with the influx of swarms of kin-bound collectivistic, rule-ignoring migrants from..the Balkans and Galicia”. People like Popper and Hayek – whom Perry Anderson writes of as a White Emigration, I think in his English Questions – “would seem to be haunted by the contrast between the creativity of an individual bourgeoisie and the cultural sterility of kin-hugging gregarious migrants from some Balkan zadruga, whose clannish and collectivist leanings threaten liberty and progress’ (Plough, Book and Sword, London, Collins Harvill, 1988, 26-30). This is basically familiar populist/liberal cleavage known in much postcommunist politics literature in a new guise, it seems. Shades too of the Victorian liberal reaction to the political rise of the working class and the influx of Irish navvies, except that this political/rule class succeeded in integrating such ‘swarms’ culturally and politically. There was no Habsburg Disraeli and no compelling Austrian political identity akin to Britishness, though as Tom Nairn suggests in recent writing the British state at the turn of the 21st century had a whiff of Habsburg Austria about it. However, do many of the problems of democratic politics and planning he describes in Road to Serfdom and elsewhere not recur in ‘planning for freedom‘ especially in the context of transition from totalitarian rule – the problem of reaching prior agreement and subsequently agreeing to stick whatever the consequences. When no such agreement is forthcoming is there not here a tendency to fudge things with propaganda and the delegation of powers from divided parliaments to unaccountable all-powerful technocrats (or authoritarian modernizers?) and back again to populist politicians backed by collectivist democratic majorities. However Czech and CEE experiences – as Greskovits suggests was not this Latin American scenario this would imply Here, however, the slippery concept of ‘planning‘ needs unpacking. Can it be extended from an etatistic command planning to top-down technocratic policy-making. How did Hayek envisage the implementation of Constitution of Liberty with associated interventions into the democratic process as previously understood? What political vehicles did in anticipate – in practice the IEA and Mrs T, as we know, but what is implied in his writings. Time to read dear old Friedrich more carefully. Came across an interesting online review of book of essays by Hayekian economist Peter Boettke (Calculation and Co-ordination: Essays on Socialism and Transitional Political Economy, New York, Routledge, 2001), one arguing that USSR and shifts in late Soviet politics understandable less in terms of rational central planning and various rebounds from its failure (perestroika period etc) than the ‘sale’ and ‘resale’ of monopolies by a collective (in Stalin’s case personal) dictator – i.e. that USSR was an extreme form of mercantilism understandable through existing political economy categories (same kind of argument used in relation to late socialism by Friedman and following him Klaus). Point of interest for me is that it highlights essential continuity with rent-seeking forms of post-Soviet capitalism and illiberal democracy described in Hellman’s famous ‘Winner Takes All’ article, less well known work by John Gould and probably many others. Is – how is – Boettke’s argument applicable to apparently more transparent and liberal-democratic CEE, where there is a more subtle admixture of clientelism, liberalism and rent-seeking. The beached European Constitution and apparent derailment of significant further integration and enlargements, he notes is the product of the collision of the erstwhile pattern technocratic and intergovernmental integration and enlargement with the more desire to bridge the democratic deficit through referenda (the most vehicle for open, populist politics) rather than strong European level democratic institutions (more powerful European Parliament, Commission as more of EU ‘government’ accountable to Parliament etc). Referenda may have delivered (sort of) as device for legitimating decisions already taken in the special circumstances of CEE accession referenda of 2003, but are now to use Paul Taggart’s phrase ‘a touchstone of dissent’ for a range of issues (some EU-related, some not) from a range of constituencies of left and right. Mark Leonard’s solution? Not incremental adoption of bits of Constitutional Treaty sans referenduns, still less the French Europe des projets, both likely to be ineffective in the long term and a target for populist and nationalist resentments (even if they were politically attainable in the short term) but ‘smart referenda’ – better co-ordinated, better timed and backed by grassroots popular engagements, NGO and civil society coalitions of the Make Poverty History type and ‘democratic functionalism’ – a focus on solving policy problems, rather than institution building. Whether he accepts the wider logic of (neo-)functionalism in the theoretical sense of the term – the gradual ‘spillover’ of integration from one sector to the next and the tendency of interests to burst out of the national state is not made clear. Hard however not to be left which the impression that the briefing is very much part of the problem it describes – a top down elite-oriented primer for politician and bureaucrats on how to ‘face the voters’ over Europe., its vision smelling more astroturf than grassroots participation. Stealth Democracy in Europe perhaps?